This Pendent holds a hidden Crystal in the back. 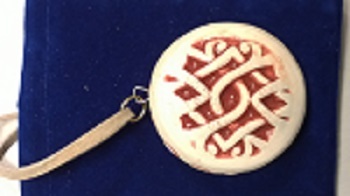 The Pendent is made from earthenware clay. It can be worn or placed on your key chain. The reason for the Hidden Crystal is to keep your energy level from being affected from outside influences. Wholesale inquires welcomed!